In today’s review, we’ll be focusing on two popular all foam mattresses, Nolah vs Leesa, coming from two well-known online mattress companies. The Nolah mattress is unique in that it delivers the benefits of memory foam without the use of the memory foam. Nolah created their own proprietary foam, Nolah Air Foam, which sleeps cooler than memory foam and is more durable than latex. The company also sets themselves apart from other companies by defending wildlife and contributing to its preservation by adopting an endangered American wildlife animal in the customer’s name for each sale. The Nolah mattress is 10″ thick and made up of 3 layers of proprietary Air Foam, Avena latex, and support foam. The Nolah is a universal comfort model and it only comes in one firmness option, which we rate at a 6-7 out of 10 (10 being the firmest). It initially may feel a little bit firm, but after a week or two, it totally adapts to your body. This model is ideal for all sleeping positions as it offers enough give in the top comfort layer to support your shoulders and hips and has necessary firmness if you switch to your back or stomach. Although the Nolah mattress initially feels rather firm and not as cushioned, as the time passes your body adapts to it and molds to memory foam. The Air Foam and the Avena latex in its construction work well together to provide the classic memory foam feeling of body hug and contour without causing you to feel trapped in a mattress. The latex does a good job at supporting your body and providing good responsiveness when changing positions during the night without causing excessive motion transfer. The Nolah does a good job at creating a cool sleeping surface due to the use of the proprietary Nolah Air Foam. It retains a minimal amount of heat which is typical for most all foam mattresses, but it’s nothing too serious to cause sticky, sweaty feeling and deprive you of sleep. With the Nolah mattress sinkage and motion transfer are reduced to the minimum. Andrew who is 230 lbs compressed the mattress to a certain degree, but he did not sink all the way down through it and come to rest on its foundation which is often the case with other all foam mattresses. Edge support is also good with this mattress as edges don’t compress when sitting or lying near them, and they don’t cause the feeling of rolling off the bed. The Nolah had an average amount of off-gassing when taken out of the box and packaging. This is to be expected due to its all foam nature and the fact that it is delivered wrapped in a plastic package within a box, but any smell that was present dissipated within a few hours. This model is reasonably priced coming in at $850 for a Queen, which is a good price given the quality materials used in its construction. You can save $125 on this price by applying our Memory Foam Talk coupon: MFTALK. 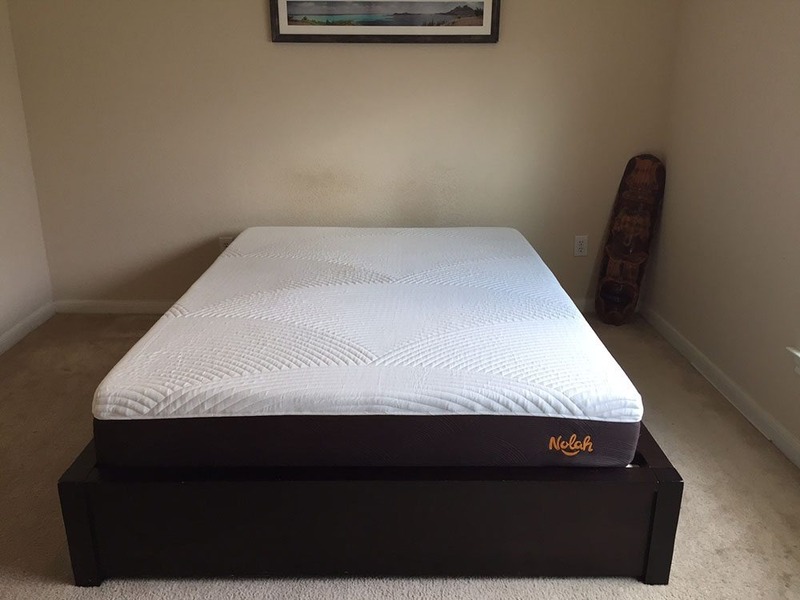 Click here to read the full Nolah mattress review. The Leesa, like the Nolah mattress, comes in a universal firmness option designed to appeal to a wide range of sleepers, and it is around a 5/6 out of 10 on the firmness scale, with 10 being the firmest. While the Leesa has a soft and comfortable exterior and the Avena foam in the top cooling layer provides a bit of responsiveness and bounce, it does not provide enough support and comfort like the Nolah and other all-foam mattresses we have tried out to date. Below is our comprehensive side-by-side comparison of the Nolah vs Leesa mattress. Memory foam feel – As it has been already mentioned, this mattress offers a classic memory foam feel without the actual use of memory foam. The company created their own Nolah Air Foam which sleeps cooler than memory foam and is more durable than latex. It perfectly molds to your body and provides a hug typical for memory foam mattresses without causing you to feel trapped. Supportive mattress – The Nolah mattress does an excellent job at supporting your body in all sleeping positions. It will not compress too much under your weight, and it will not cause you to sink down to the foundation. Sharing your bed – With this mattress, there is almost no motion transfer which means that it is perfect for couples. So, if you plan on sharing your bed with a partner, the Nolah mattress may be the right pick for you. It will allow you to move freely around your bed and get in and out of it during the night without disturbing the sleep of your beloved one.